When you turn on the water, did you know it likely comes from the Lagunitas Creek watershed? Yes, it’s possible it could come from Phoenix Lake, which is in the Corte Madera Creek watershed, but Phoenix Lake is primarily a reserve supply because it costs more to pump and treat than Lagunitas Creek water from Alpine or Kent lakes. This potable water is delivered to the Corte Madera Creek watershed via an ingenious network of reservoirs, pipes, tanks and pump stations designed and constructed by the Marin Municipal Water District (MMWD), projects begun in the early 1900s and lasting largely through the 1950s. Importantly, they take advantage of gravity wherever possible. Key facilities of which you may be aware are Pine Mountain Tunnel, Concrete Pipe Road (both near Fairfax) and Ross Reservoir (the one that looks like a covered swimming pool above Phoenix Lake). These facilities are around 100 years old and at or near the end of their useful lives. While Concrete Pipe Road has had its pipes and valves recently replaced, the Ross Reservoir is deteriorating and is threatened by a downslope landslide. Pine Mountain Tunnel, which was converted from a raw water conveyance system to treated water storage, doesn’t meet modern standards for water storage. Approximately 1 million gallons of the 3.7 mg stored in the tunnel serves Ross Valley. Treated water is pumped up to Pine Mountain Tunnel from the San Geronimo Treatment Plant, and it can also be conveyed to the tunnel by gravity flow from the Bon Tempe Treatment Plant. 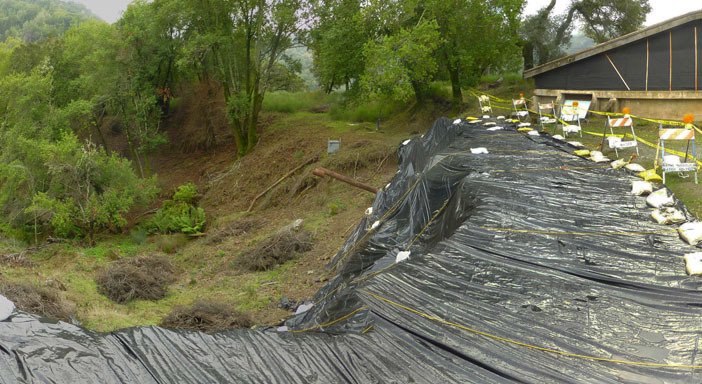 The natural environment of the Corte Madera Creek watershed was considerably damaged by the construction these facilities. The main impacts were landform alterations, multiple road-related creek crossings (some bridges, but mostly culverts) and the loss of vegetation. The roads also facilitated the spread of invasive, nonnative species through the area. Persistent impacts are erosion or sedimentation from the Ross Reservoir landslide and unpaved roads, and the continued spread of invasive plants. The replacement of the Ross Reservoir and Pine Mountain Tunnel present further environmental issues. If the people of the Corte Madera Creek watershed want clean, reliable water, then yes, we need to fix Ross Reservoir and find a solution for water storage in Pine Mountain Tunnel. MMWD has also decided that additional water storage is needed for better reliability, especially in the event of a natural disaster or prolonged power outage. MMWD, which relies on electricity to pump water uphill to holding tanks through much of Marin, is the largest user of electricity in the county. For this reason, one could argue that Pine Mountain Tunnel should be retained as a gravity-powered water conveyance facility, one that doesn’t use electricity or contribute to greenhouse gas emissions in its operation. So, what’s the best solution? About five years ago, MMWD proposed building a new 4-mg tank at Five Corners (just off of Deer Park Road, on the ridge between Deer Park School and Phoenix Lake), and replacing the 1-mg Ross Reservoir with two new, 2-mg tanks. This would have almost doubled current storage, from 4.7 mg to 8 mg, an amount that MMWD believes is adequate for operational and emergency storage needs. However, this proposal, which would have been one of the largest infrastructure projects in the Corte Madera Creek watershed in decades, was abandoned due to environmental and logistical issues, including significant earth excavation, numerous truck trips, restricted work windows (mainly due to northern spotted owl nesting), impacts on recreation, and questions about how much storage is actually needed for operations and emergencies. MMWD is now looking at a phased approach that could begin as soon as next year: 1) construct a new bypass pipeline and fix the slide at Ross Reservoir, 2) construct 4 mg of storage at Ross Reservoir, and 3) reassess the need for additional storage and the Pine Mountain Tunnel replacement. The cost is estimated to be about 20.7 million dollars. If the reassessment determines that a total of 8 mg of water storage is necessary, this cost could double. The construction of 4 mg of storage at the Ross Reservoir site would still be the largest infrastructure project in the area since the construction of the Bon Tempe Water Treatment Plant in the mid-1900s. This construction would still require significant earth movement, numerous truck trips, the need to work around special-status plant and animal species, and road and trail closures that would impact the public. Another 4 mg of storage, for a total of 8 mg, would only increase the severity of these impacts. The real question appears to be, how much additional storage is needed, and at what environmental and fiscal cost? A staff report presented at the District Operations Committee’s meeting of September 21, 2018, provides a good update on the project, and is available on MMWD’s website. The next formal opportunity to comment on the project will not likely be for another year or more. It is anticipated that a scoping meeting for an Environmental Impact Report will be held in 2020. In the meantime, you can voice your opinions to the MMWD Board of Directors. Larry Bragman, Jack Gibson, and Larry Russell are directors whose divisions include portions of the Corte Madera Creek watershed. If you have questions, your Board member should be able to direct you to staff who can provide answers. Because of its complexity, cost and potential environmental impacts, the more the people of the Corte Madera Creek watershed know about this project, and the sooner they know about the assumptions being used and the decisions being made, the more transparent and acceptable such decisions will be.